At Empire Contractors, we specialize in commercial roofing. 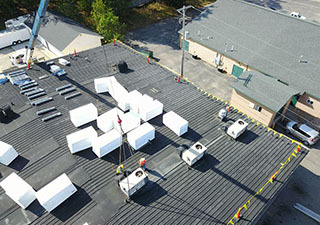 Single-ply roofing is one of the most common commercial roofing systems. Single-ply roofing is known for being a durable, flexible, and cost-effective roofing system. Whether you need a single-ply roofing repair, restoration, replacement, or installation, we can help. For a free onsite estimate, clients in Muskegon, MI can reach us at (231) 578-4760. There are many kinds of single-ply roofing. Each kind has unique benefits, so it really depends on your building, budget, and preferences. Here at Empire Contractors, we have experience working with a a variety of single-ply roofing materials, including EPDM, TPO, and PVC. An EPDM roof is one of the most cost-effective roofing systems on the market. With proper maintenance, this affordable roof can last over four decades before needing to be replaced. The material is fully recyclable, low-maintenance, and flexible. Plus, EPDM roofs are quick and easy to install. This fast-growing type of single-ply roofing is the best on the market for making a building more energy-efficient. The white membrane effectively reflects the sun helping you save a significant amount of money on energy costs. This type of system can be fully-adhered or mechanically attached. This strong membrane is fiberglass reinforced and also comes in white. 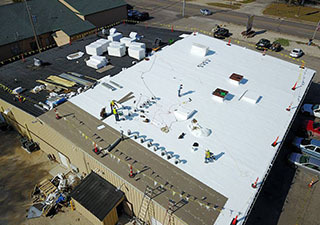 This type of roofing system is often used on buildings that are exposed to chemicals because of how resistant the membrane is. The seams are strong and heat welded. When Empire Contractors comes by to evaluate your roof, we’ll be able to go into more detail about your single-ply roofing options. We install new systems flawlessly so that you can have a roof that will last you decades. We can also restore your single-ply roofing system with a roof coating, which can have your roof watertight for years longer. Empire Contractors is the top choice for clients in Muskegon, MI. We offer a variety of single-ply roofing services, from repairs to replacements. To schedule a free onsite estimate, just give us a call at (231) 578-4760. We look forward to working with you!